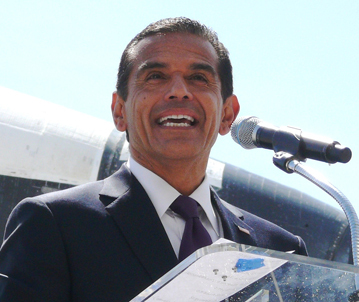 Mayor Villaraigosa recently celebrated the opening of the newly renovated City Hall Park, which has been undergoing restoration since December of 2011. The renovation design, chosen by the public and the city, includes needed updates to landscape design, irrigation systems, lighting, and plant selection. “The new City Hall Park is not only a historic and cultural monument, it is also a symbol of sustainability,” said Villaraigosa. For more than 80 years, the 1.71 acre park surrounding the main City Hall campus has served as a gathering place for the community, elected officials, and peaceful assembly. Designated a historic-cultural monument in 1976, the park provides a centralized green space for all Angelenos to recreate in the middle of the urban civic center. “I am proud of the collaborative work that was done to restore our City Hall Park. Now, it is both lush and more environmentally-conscious, making it an open space we can all be proud of,” said Councilwoman Jan Perry who dedicated over $550,000 in Council District Nine park funds (Quimby) to support the project. The design removed over half of the turf and planted low water use and native plants, including the first official city of Los Angeles native plant, the Toyon. These new plants include labels to increase public education around sustainable planting. Water use in the park will be reduced by more than a third using smart irrigation and low-impact development, and LED lights have been installed as well as decomposed granite pathways. Additionally, the upgrade included restoration of to the Flint Fountain and the Fireman’s Memorial. “By working together with community members, nature conservationists and a philanthropic private sector, the city of Los Angeles truly has a City Hall Park that everyone can take pride in,” said Councilmember José Huizar. To ensure public involvement in the new design, the Department of Recreation and Parks hosted six community meetings and launched a website where the public could review information on the conceptual plans for City Hall Park. The final design reflects the park’s history and contains a mix of traditional turf and native plants. “The spirit and style of City Hall Park represents the community it will serve,” said Patti Berman, president of the Downtown Los Angeles Neighborhood Council. Funding for the $1 million restoration and renovation was provided through a Prop 84 Grant, Quimby funds, the Los Angeles Department of Water and Power, the Metropolitan Water District, and generous donations from Scotts Miracle Grow and Home Depot. “The park at City Hall must always be emblematic of our great city,” said Barry Sanders, president of the Recreation and Parks Commission. If the public is interested in making a donation to this and other park projects, they can visit the Los Angeles Park Foundation website at: http://www.laparksfoundation.org.